The usual spoiler-filled preview of the next issue of Weekly Famitsu was posted on the official website today and it's another generous reveal, with pictures of Rikyuu as Ken, Maria as Rose, Ieyasu as Ryu and Kasuga as Chun-Li in Sengoku Basara 4 Sumeragi. The article's main feature will be about the return of Kenshin and Kasuga as playable characters and their movesets. In addition, there will be more Tenka Medal updates. Full details will be included in the magazine, which goes on sale on Thursday (Japan time). I'll update with a summary of the article on Wednesday night. I guess promoting Sengoku Basara at the regular Jump Festa events has been successful as it's now been announced that Sengoku Basara 4 Sumeragi will be featured at the Jump Victory Carnival 2015 event on 18th July 2015 (Tokyo) and 25th July 2015 (Osaka). The game will be exhibited together with Monster Hunter Spirits and Dai Gyakuten Saiban. Visitors are being promised the chance to try a demo of the game at the Capcom stand. Speaking of events, it's also been confirmed that Capcom will be running prerelease demo events at the HAL vocational colleges (they did the same thing in the run-up to Sengoku Basara 4's release). The 'open campus' events for prospective students will take place on 21st June 2015 (HAL Osaka) and 27th June 2015 (HAL Tokyo). As well as the chance to try the game out before release day, attendees will be able to experience a lecture from Sengoku Basara series director Yamamoto Makoto! Amazon Japan is now offering the book of questions which was promised when the official Sengoku Basara exam was announced back in April. Scheduled for release on 25th June 2015, the Sengoku Basara Kentei: Koushiki Mondaishuu ('The Sengoku Basara Qualification: Official Exam Questions') will cost ¥1,080. According to the book's description, it will include a total of 300 questions on topics such as famous scenes, dialogue and characters and cover all of the titles in the series, from the first Sengoku Basara through to Sengoku Basara 4 Sumeragi. It can be used to help study for the official test or simply as a fun way to increase your general knowledge, whether you're a newcomer to the series or a dedicated fan already. There will also be plenty of full-colour pictures of the characters. 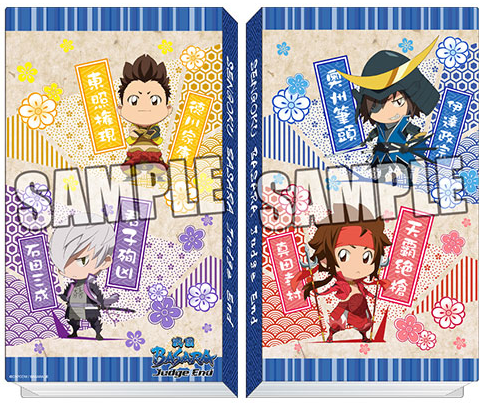 Ami Ami is listing another new Sengoku Basara Judge End item in the form of this sticker folder. It's priced at ¥1,080 and due for release in late July 2015. Wabisuke will look like Violent Ken from SNK vs Capcom. Also Chun-Li Kasuga... <3 The others look great too of course, but Kasuga finally getting to wear something not quite so revealing but that still compliments her beauty is heartening for me. I spent some time yesterday squinting at the tiny text on the preview image but gave up in the end. It's going to be a good Weekly Famitsu this evening. I haven't written about this yet since I want to combine it with a post about something else and probably won't have time today, but last week's Dengeki Maoh (which I just received) has a comment from YamamotoD explictly confirming that Kasuga will be getting a story in Sengoku Basara 4 Sumeragi too. He said there's a scene involving Sasuke which touches on her past. Hopefully there's a bit more information about that in this week's big update! Indeed so. Dear lord I'd be all over that! Oh wow, something about her past?! That really excites me! We really don't know much about her life before she tried killing Kenshin and.... well ended up joining him. That's so cool! Saw the low res picture of all 4 alts earlier today. Couldn't understand who was wearing Ryu's and Chun's outfits. I mean I love Chun Li's visual design a lot and yeah, she's pretty much a SF series' poster gal but I couldn't guess the reference they were trying to achieve here. Cammy's attire would make way more sense for Kasuga (both starts as asassins but change their ways, also I recall Cammy using invisible wire in Street Fighter V anime series (which is completely non canon BTW) like one of those Kasuga using with her kunai) but developers obviously didn't want the player to see too much of Beautiful Blade's behind during the game so that's probably a decent excuse to not to go with it. Still Chun's outfit is not suited for anyone but maybe Naotora in my opinion and this choice is questionable at best. Maria-Rose is a surprise I must admit. Something I would never expect, lol. Aside from dress code they have nothing in common though but still Rose's design fits Maria well. Not too fond of Rose to be honest but whatever - it's the only SF-themed outfit that goes BASARA I like so far. I'm extremely bored with karate gi so both Ryu and Ken can be considered a "waste of slot" in my wardrobe. Anyone could wear it looking generic as hell in result. Rikyuu is questionable since Sabisuke's hairstyle would make a laughable Ken I'm afraid (especially if you consider the way he moves around the battlefield). And Ieyasu getting another costume (and not even a good one at that) was totally unnecessary if you ask me. In other words color me disappointed with this batch of costumes. Hope they redeem themselves with the next one. It's a bit disappointing that Nobuanaga and Mitsuhide didn't get their hoped-for costumes (I really liked imagining Balrog/Claw). I think they're going for the most iconic costumes which explains Chun-Li, Ryu and Ken; I'm not sure Rose is actually that famous outside of the core audience but maybe they just wanted something which Maria would look good in since she's a main character. In which case, will Yoshiteru be wearing a Monster Hunter costume?